Performers include: Roger Ebert, Gene Siskel, Richard Roeper, Michael Phillips, Ben Lyons, Ben Mankiewicz, A.O. Scott, and Michael Phillips. This syndicated program features two movie critics discussing, arguing, and critiquing the latest movie releases. Recent releases of VHS and DVD films are also often discussed. Having left a similar program on PBS (Sneak Previews) and then a syndicated one for Tribune (At the Movies with Gene Siskel and Roger Ebert), newspaper critics Gene Siskel and Roger Ebert began hosting this syndicated show for Disney. It was initially called Siskel & Ebert & the Movies and was later known simply as Siskel & Ebert. 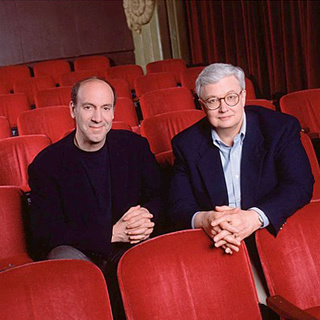 In 1999, Siskel died from a brain tumor and the program was renamed Roger Ebert & the Movies. Various film critics filled the second spot until 2000 when Richard Roeper was chosen as the permanent replacement. The series was renamed Ebert & Roeper and the Movies and was soonafter shortened to just Ebert & Roeper. In 2002, Ebert was diagnosed with thyroid cancer and in 2006, his spot on the show was filled with guest critics for awhile. In the summer of 2007, the program’s title was changed to At the Movies with Ebert & Roeper. In 2008, Ebert was permanently replaced on the show by Michael Phillips and it was rechristened At the Movies. Ebert and Roeper ended their association with the show in August 2008 and younger critics Ben Lyons and Ben Mankiewicz were hired to host. Disney hoped the pair would attract a younger demographic but the ratings fell. They were replaced after a year by A.O. Scott and Michael Phillips. After a year of that, At the Movies was cancelled. The final episode includes reviews of Eat Pray Love, Scott Pilgrim vs. the World, and The Expendables. Scott and Phillips pay homage to their predecessors and sign off. First aired: August 14, 2010. What do you think? Do you like the At the Movies TV series? Do you miss it now that it’s been cancelled? More about: At the Movies, At the Movies: canceled or renewed?